"When we encountered the monkeys during [John's] tour, he showed us how they were entangled in social and ecological networks (occasionally involving humans) while keeping their capacity for flight. "John recounted some monkey behaviors as evidence of higher­-order learning -- an awareness of the context of their interactions with people. 'If you meet one of these monkeys on land, when you are walking and they are up in the trees, and you stare directly at them, they will raise hell and come at you,' he said. 'But if you are in a boat and you stare at them, they will just sit there on the bank looking back, waiting for a hand-out.' Thus they clearly distinguish between kinds of beings in the world: boat people are distinct from land people. Boaters with food are beings of active interest, while boaters with none are of little concern. 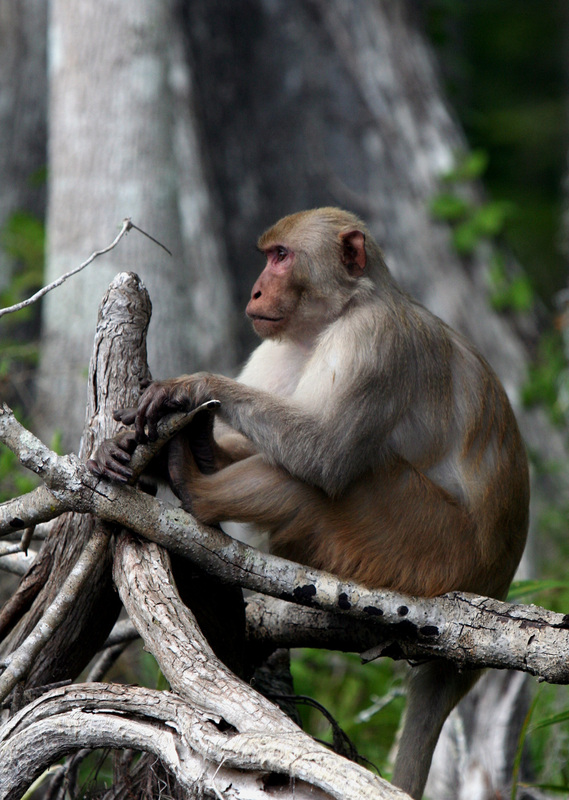 Macaques understand human ontologies in terms of our actions. Boaters who are feeding are beings that they are actively trying to generate. Monkeys try to transform stingy boaters into feeding boaters by cooing and even staring. "Power dynamics in macaque societies have been extensively studied by primatologists. Female rhesus macaques obtain rank based on the posi­tion of their mother within the matriarchy, with each new daughter get­ting a higher rank than her older sister. Males generally join new groups of unrelated individuals as adults and constantly jockey for position. They usually follow a 'seniority rule' where they rise in rank as other males leave or die. The alpha male, who is dominant over all other members of the group, usually does not hold this rank very long. The top-ranking female is dominant over all other females and males (with the exception of the alpha male). Nested hierarchies produce one counterintuitive re­sult: the third-highest ranking member of a rhesus macaque society is the alpha female's youngest daughter."